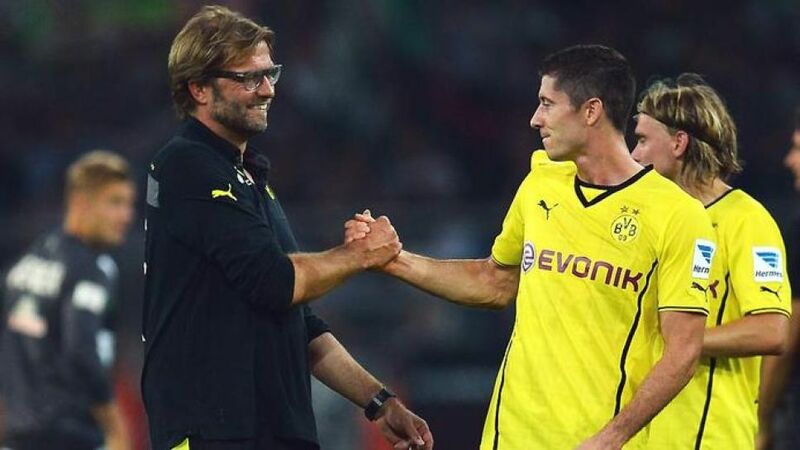 Klopp: "Robert worked his socks off"
Munich - Jürgen Klopp praised striker Robert Lewandowski for a fighting display after the Pole's winner against Werder Bremen on Matchday 3, while FC Bayern Munich head coach Pep Guardiola credited 1. FC Nürnberg for their "unbelievably good" organisation. Jürgen Klopp (Borussia Dortmund): We wanted to play quickly but that led to our play becoming rushed, and that wasn't the plan. In the second half, though, we kept our foot on the gas and it was really important to score when we did. I'm pleased that scored the goal - he worked his socks off. Robin Dutt (Werder Bremen): It was a deserved win for Dortmund that could have come by a greater margin, and we were slightly lucky that they didn't score sooner. We were hoping to hit them with a sucker punch on the break, but we couldn't make anything happen when we won the ball. We're getting much better defensively; going forward we still have a little way to go. Pep Guardiola (FC Bayern Munich): The win was important and I'm happy, especially with the second half and the way we controlled the game. We can always attack quickly when Franck or Arjen have the ball. Nürnberg were unbelievably well organised. It's always a tough game against them. Michael Wiesinger (1. FC Nürnberg): Our plan was to be very compact and give Bayern no room to play. We had a good chance when hit the crossbar, but in the second half we lost some freshness. It was a deserved win for Bayern, but my players fought really well and showed a lot of passion. Mirko Slomka (Hannover 96): We were great in the first half, deservedly went in front and then managed to get the important second goal. Schalke showed good spirit after half time and weren’t affected by being down to ten men. We couldn't really control the game like we did in the first half so I’m happy that we were able to get over the line. Jens Keller (FC Schalke 04): We started the game nervously, but we were also feeling the effects of Wednesday’s match [against PAOK FC]. We didn’t play well in the first half but were much better in the second half and had a great chance to equalise. I think our second-half display merited a point but we leave empty handed. Jos Luhukay (Hertha Berlin): It was a tight and a tense game and neither team had many chances. Thankfully for us, we were able to score the decisive goal. It was a good goal too from , who often manages to score important goals for us. He did a lot for us in Bundesliga 2 last season and is a really important player for the team. Thorsten Fink (Hamburger SV): We showed a good reaction after last week, especially in terms of competing for every ball. In the first half we defended our goal well, but needed to be a bit more creative going forward. In the second half we played very well but switched off once and that led to the goal. I'm satisfied with our performance, if not the result. Markus Weinzierl (FC Augsburg): We fully deserved this victory. The goal Stuttgart scored just before the interval made things a little tense and they might have nicked a point from us. We couldn’t find the killer pass to get the third goal and kill the game off. But we have our first win of the season and travel to Nuremberg next week with confidence. Bruno Labbadia (VfB Stuttgart): Unfortunately we completely went to sleep in the first half. You can't take anything from Augsburg if you don't compete in the 50/50s. In the second half we were better but the red card made it more difficult for us. We have to look at our own performance though. Torsten Lieberknecht (Eintracht Braunschweig): It was a disappointing day for us. For long periods of the game we played without the necessary confidence. Frankfurt took advantages of our mistakes in the second half and then it was difficult for us to come back. But we certainly won't be throwing in the towel after just three games. Armin Veh (Eintracht Frankfurt): We had around 70 per cent possession, so that shows that we're doing something right. The only criticism I can think of is that we didn't score in the first half when we were well on top. [Vaclav] had only trained once with the team and I was happy with his performance.